Coque is a gourmet / formal restaurant offering Spanish cuisine. The average price of a main course dish at the Coque restaurant is 25 euros. The average price of a 3-course meal at the Coque restaurant is 60 euros. Note that although GoMadrid.com strives to maintain all information about Coque up to date, the prices mentioned are only an indication and may not reflect the exact value of your meal. Since 1999 and based on 40 years' experience, chef Mario Sandoval has been giving a personal and creative touch to this restaurant's cuisine, combining tradition and experimentation with cutting-edge textures and tastes. What makes this restaurant unique is the use of seasonal products, intensified by the chef's respect for the balance between taste, appearance and the ingredients that make up a dish. The four brothers - Rafael, Juan Diego, José Ramón and Mario, the youngest, have created a real revolution where excellent cuisine is the order of the day, along with a wine card that offers around 700 different labels from the most important wine regions from around the world and an attentive and refined service. Following an elaborate refurbishment of the original premises of years gone by, Restaurante Coque has become even more accommodating in meeting clients' demands. The restaurant has two dining-rooms with a capacity for 60 persons as well as a private cellar/dining room downstairs for business dinners, wine tasting and parties. The kitchen measures 100 m2 and is equipped with the latest technology. 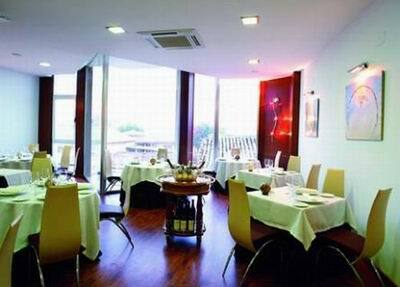 The address of the Coque restaurant is: Francisco Encimas, 8, Humanes de Madrid, 28970 Madrid. Please see the Coque restaurant location map below.